Power amplifier is the part of audio electronics. It is designed to maximize the magnitude of the power f given input signal. In sound electronics, the operational amplifier increases the voltage of the signal, but unable to provide the current, which is required to drive a load. 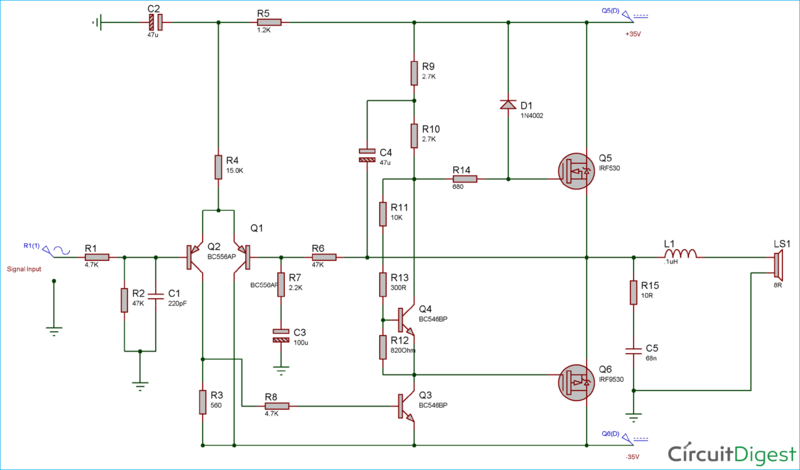 In this tutorial, we will build a 50 Watt RMS output power amplifier using MOSFETs with a 8 Ohms impedance speaker connected to it. In an amplifier chain system, the power amplifier is used at the last or final stage before the load. Generally, the Sound Amplifier system uses below topology shown in the block diagram. In previous tutorials, we made 10 Watt power amplifier, 25 Watt power amplifier and 40 Watt power amplifier. 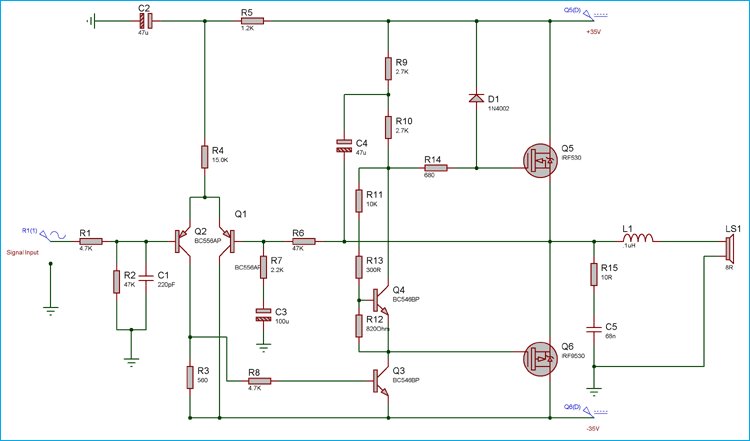 But in this tutorial, we will design a 50 Watt RMS output power amplifier using MOSFETs. In previous tutorials, we used dedicated power amplifier IC, TDA2040 for 25 Watt and for 40 Watt amplifiers, but in this design, we will use complimentary pair N and P channel MOSFETs to get the 50Watt power output. The output will be quite stable and the THD will be minimum. We will drive 8 ohms Load with it. We used two widely popular complementary MOSFETs IRF530N and IRF9530N which are widely available in local shops as well as online stores. In the above image, the left one is the IRF530N and the right one is IRF9530N. Both are a TO-220AB package. Those two MOSFETs create push-pull operation to drive 8 Ohms 50 Watt RMS speaker. Fine Aluminum heat sink with 2mm thickness and 50 mm x 30mm dimension. Resistors (10R, 300R, 560R, 680R, 820R, 1.2k, 2.2k, 10k, 15k) – 1nos. Resistors (2.7k, 4.7k, 47k) – 2nos. The schematic for this 50 watt Audio Amplifier has a few stages. At the beginning of the amplification, a low pass filter blocks high-frequency noise. This low pass filter is created using the R1, R2, and C1. The resistors R1 and R2 have two operations, first it is a part of low pass filter, second, it is a voltage divider as well as a current limiter. On the second stage of the circuit, Q1, and Q2, which are BC556 transistors, work as a differential amplifier. Next, the Power amplification is done across two MOSFETs, IRF530N and IRF9530. These two MOSFETs are complementary and matched pair. Two MOSFET has the same specification, but one is N-Channel and another one is P-channel. This is an important part of the circuit. These two MOSFETs are acting as a push-pull driver (A widely used amplification topology or architecture). To drive these two MOSFETs, Q3 and Q4, BC546 is used. These two transistors provide enough gate drive to the MOSFETs. R15 is a high wattage resistor which acts as clamping circuit with the capacitor 68nF and 1uH inductor is added for providing stable amplification to the 8 Ohms Loudspeaker. We are powering the circuit using +/- 35V and the input sinusoidal signal is provided. The oscilloscope’s channel A (Yellow) is connected across the output against 8 ohms load and the input signal is connected across channel B (Blue). We provided very Low-frequency sinusoidal signal of 25-50Hz. As in low frequency, the amplifier will deliver more current to the load and the multimeter will be able to detect the AC voltage properly. When constructing the circuit, MOSFETs are needed to be connected with the heatsink properly at Power amplifier stage. The larger heatsink provides a better result. It is good to use audio grade rated box type capacitors for a better result. It is always a good choice to use PCB for Audio related application. Make the traces of differential amplifier short, and as close as possible to the input trace. Keep the audio signal lines separated from noisy power lines. Be careful about the traces thickness. As this is 50 Watt design, a larger current path is required, so maximize the trace width. Ground plane needs to be created across the circuit. Keep the ground return path as short as possible. In this 50 Watt design, few improvements can be done for better output. Add 220uF decoupling capacitor with at least 63V rating across the positive and negative power track. Use 1% rated MFR resistors for better stability. Change the 1N4002 diode with UF4007. Change the R13 with a 1k potentiometer to control the quiescent current across the power MOSFETs. Use toroidal Inductor instead of Air core with .25uH 5A. Add Fuse across the output, it will protect the circuit on speaker overdrive or output short circuit condition.